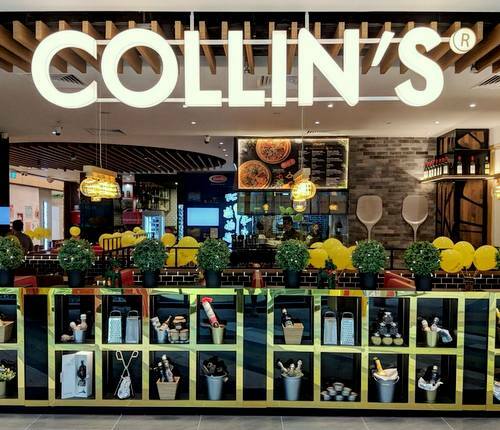 Collin’s Japanese & Western cuisine restaurant has five locations in Singapore, including one within Northpoint City (1 Northpoint Drive). Founded by Chef Collin Ho in 2012, Collin’s is a local eatery with a menu constructed out of extremely affordable, high quality Western and Japanese dishes. The restaurant emphasizes attention to details in everything they do, from thoughtful selection of ingredients to the way the food is prepared and served to you. …COLLIN’S Club Wagyu Burger, Pork Chop & Mangalica Sausage, Prawn Marinara, Mediterranean Black Pepper Seafood Tagliatelle, Funghi Porcini Ravioli, Tranchero Pizza, Warm Chocolate Fondant, and Italian Lemon Sorbet. The best way to familiarize yourself with Collin’s current menu and price ranges is to browse it at the official website. You can find the menu on the official website (www.collins.sg) behind the link for “MENU”.